In order to use certain features or apps, you need to sign into an account. For example, to sync data to Samsung Cloud, you need a Samsung account. Or if you want to download that brand new app from the Play Store, you need a Google account. See where we're going with this? Read on to learn how to add your accounts in a snap. Let's begin with your favorite account. The best way to bring out the full potential of your Galaxy Phone is to add a Samsung account so you can experience all of the exclusive features. 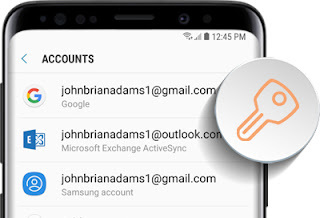 To add a Samsung account, navigate to Setting, and then search for and select Accounts. Touch Add account > Samsung account and then enter your Samsung account info to sign in. And if you don't already have an account, don't worry. Just touch CREATE ACCOUNT to start one. Can't live without Google? To use the Google Play Store and download apps from it, you need to add a Google account. Navigate to Settings, and then search for and select Accounts. Touch Add account > Google and then enter your Google account information to sign in. Last, but not least, to add an email account and receive emails through the Email app, navigate to Settings, and then search for and select Accounts. Touch Add account > Email and then enter your account information. Note: Depending on your email provider, you may be required to manually give access to the app on your phone. If necessary, sign into your account via Internet, and then turn on the access to allow the use of the app.